ADA 20th Anniversary - Carolyn et. al. Twenty years ago, Stanley Soden likely found that some of the activities most take for granted were at best troublesome, if not nearly impossible. Going to the beach? Nearly out of the question. Grabbing a cup of coffee at a local diner? Not likely. Attending a baseball game? Possibly, but with a good deal of extra planning. That was before the Americans With Disabilities Act — a civil rights act for people with disabilities that mandates equal opportunity in employment, accommodations, transportation and several other areas — which was signed into law 20 years ago Monday. Soden, who uses a wheelchair, is a director for a Long Branch-based support organization for people with disabilities. He said the passage of the ADA has made significant changes in his life. "It has given me access to the beaches, to the restaurants and places that 20 years ago I would have never had access to," said Soden, who is a director of independent living services at MOCEANS. "The access to me is far greater than it ever has been." The act has not proved to be a panacea for those living with disabilities, experts said. But the ADA has made possible great strides in improving the lives of 54 million people — 19 percent of the nation's population, according to 2005 U.S. Census figures — who live with some form of disability. In Monmouth County , an estimated 39,081 live with two or more types of disabilities, according to the U.
S. Census Bureau. In Ocean County , that number is 43,608.
public entities and public accommodations. It makes illegal any discrimination based on disability in hiring or firing of employees, by any level of government or transportation run by any government, or in any public accommodation. One of the definitions of "discrimination" includes architectural barriers to allow entry and accessibility by those with disabilities. All buildings constructed after 1992 — the effective date of the ADA — have to be in compliance. Older buildings are not exempt, but businesses are allowed leeway if modifications were not "readily achievable," according to the law. and independent living specialist at MOCEAN's Ocean County office. "Stores have electric doors that just sweep open, there are fewer steps, many more ramps are in place for those older buildings. Many places are fully accessible." One of those places is the Americana Diner on Route 35 in Shrewsbury . A retrofit of the restaurant was done in 1997, making the formerly inaccessible restaurant accessible, according to George Louzakos, an owner. "Before we had no handicapped access," Louzakos said. "We put in wider doors — from bathrooms to even a dining room door that opens out — the whole nine yards." There has been a logical increase in the number of people with disabilities who now frequent the place, he said. "I have a lot. It makes me feel good," Louzakos said. "And they repeat. That's what I like." But much still needs to be done to fully integrate people with disabilities, experts say, both in terms of building access and other activities of daily living. Carolyn Schwebel, of Middletown said while some businesses, like the Americana Diner, should be lauded, plenty of others still are not in compliance with the law.
" 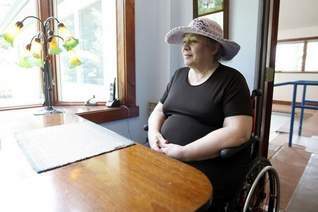 ADA is only as good as those who know and fight for their rights," said Schwebel, who uses a wheelchair. "You have got to bring complaints to the Department of Justice or to the courts." Schwebel is chair of the Middletown Human Rights Coalition and has initiated lawsuits against Middletown over beach access. She said she thinks some small business owners do not bring their establishments into compliance because they think it is too costly. "It really isn't," Schwebel said. "The Americana Diner has a ramp. Oftentimes when I'm there I'll see at least five people with disabilities. They get a lot of money out of it because we go there often." Unemployment, which is currently high for the general population, also is a chronic problem for those with disabilities. "The idea should not be for people with disabilities to collect Social Security and not work and not contribute to their communities when they are perfectly capable and want to," Pniewski said. Pniewski said that society's perception, or misconception, of people with disabilities that represents the biggest barrier. "We still have this attitude toward people with disabilities — "oh, poor thing.' Even in our language, like "wheelchair-bound," or that sort of thing, rather than seeing a wheelchair as a measure of freedom." Employers such as the Lakewood BlueClaws, however, are trying to change that. The minor league baseball team partners with the LADACIN Network (formerly Cerebral Palsy of Monmouth and Ocean Counties ) and the Arc of Ocean County to employ workers from each of those programs — about 16 to 20 of its 170 game day staff, team spokesman Jim DeAngelis said. "This is not a job opportunity where we stick them in the back," DeAngelis said. "They're on the front lines as greeters, ticket takers and ushers. They also work in our concession stand." Ryan Reilly, coordinator of the Office for Individuals with Disabilities for Ocean County 's Department of Human Services, said he sees examples of employers like the BlueClaws as emblematic of a positive trend. "I'm very hopeful for the future, with the knowledge getting out there, the info being spread and the general public getting to understand more of what the disability community can do, there's great hopes the future will keep progressing forward."